(dogwood family) Named for the “bunch” the berries grow in. A very symmetrical plant, the ribbed leaves, white “flower”, and berries themselves, everything is beautifully symmetrical. Not a lot of flavor, but nutritious. You can eat the whole berry, seed and everything, or make sauce out of them by throwing them in a Vitamix blender. The red berry-like fruits are edible with a mild flavor somewhat like apples. The large seeds within are somewhat hard and crunchy. 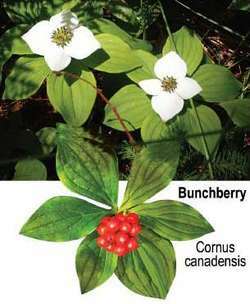 Dogwood bark is a substitute for cinchona bark, the source of quinine, for treating Malaria.